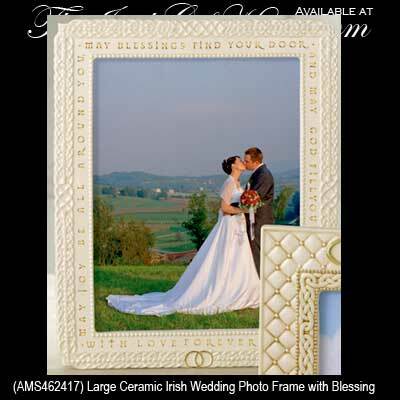 This large ceramic photo frame features an Irish wedding blessing along with Celtic knot-work. Sorry, this Irish picture frame is now sold out. This Irish wedding picture frame features embossed Celtic knot-work along with a blessing that is accented in gold. The large ceramic frame measures 10 1/2" wide x 15" tall and it holds a 8" wide x 10" tall photo. The Irish wedding photo frame is ready to stand with the attached easel and it is gift boxed with a Celtic knot history card that is complements of The Irish Gift House.